Ciao Wireless has always considered quality to be its highest priority, as it relates to all aspects and processes of the company. This commitment includes from how Ciao Wireless designs and manufactures all products and their reliability and performance, through the level of customer support and service that is provided to all, and even to how each and every Ciao Wireless vendor and employees are treated. The company’s formal quality program ensures that the highest levels of quality exist at all times. 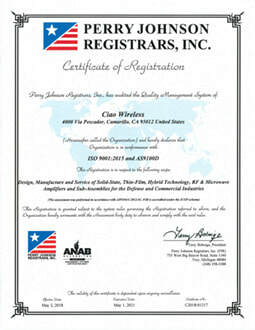 Ciao Wireless is ISO9001:2015 and AS9100D registered. 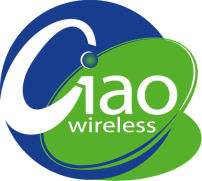 Ciao Wireless is committed to Total Quality Through Continuous Improvement. Click here for Quality Policy Statement. Further consideration of “human factors” when analyzing nonconformities, identifying causes, and developing corrective actions, and taking into account that when people perform tasks, that they are affected by things such as: fatigue, stress and morale. We are now acknowledging the fact that our employees are influenced by how much knowledge they have, how well they communicate and how much pressure they feel and how much personal support and encouragement they receive from co-workers and managers. While Ciao Wireless had previously had a counterfeit prevention program in place, AS9100D documents and mandates what many others may not have had in place already, but that what Ciao has already committed as a standard program for years, including the planning, implementation and control of processes as it relates to the prevention of counterfeit of suspected counterfeit parts and their use and inclusion in products as delivered by Ciao Wireless. It has always conducted verification activities of externally provided components/products, especially in the world of electronic components as there are high risks of counterfeit parts. Ciao Wireless has continued to work with its vendors and only works with OEM’s for key components, and flowed down the requirements to our external vendors to also have procedures in place to prevent the use of counterfeit parts, with any identified counterfeit parts “controlled so as to prevent re-entry into the supply chain”. Ciao Wireless’ commitment to furnish products considered to be “best-in-class” begins with a comprehensive Quality System that is in AS9100 and ISO9001 registered. Ciao Wireless’ Quality Assurance organization is chartered to maintain the highest level of document and process control and quality standards. Since being founded, Ciao Wireless has supplied the Defense, Military and Commercial community with state-of-the-art microwave amplifiers, sub-systems, and radial power combiners/dividers for various applications. From the beginning, the company has been committed to superior quality in the products it delivers. This commitment has been supported not only philosophically but also with the capital commitments necessary to ensure that the best available tools, facilities, and techniques are being employed in the manufacture and test of all products. Although Ciao Wireless’ Quality Assurance Program is designed to be flexible to meet customer program requirements, a defined baseline of inspection and screening criterion that ensures that all products will meet the most stringent military, aerospace and commercial requirements, has been established. All of Ciao Wireless’ products are manufactured using processes that are tightly controlled to the requirements of MIL-PRF-38534 and IPC-610 and NASA soldering and assembly techniques, as required. Units are assembled and tested in a controlled clean room environment. The environmental conditions are actively monitored for temperature and humidity to ensure product quality. Inspection criteria as defined by MIL-M-38510, MIL-PRF-38534 and MIL-STD-883 are strictly adhered to. Test and measurement equipment maintenance and calibration is performed in accordance with MIL-STD-45662A and fully traceable to all NIST/ANSI standards. Ciao performs 100% Unconditional Stability Testing on all amplifiers manufactured and shipped.